A suicide car bomb has exploded in the Somali capital, Mogadishu, killing at least 12 people and wounding eight others near the security service headquarters. The bomber targeted a security vehicle. Three members of the security forces were among the dead, witnesses said. 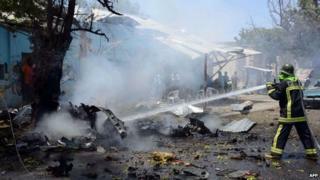 The al-Qaeda-linked al-Shabab group said it carried out the attack. The group is waging an insurgency in Somalia against the UN-backed government. "A suicide car bomb targeted a national security car passing along these tea shops," police official Abdullahi Hassan told Reuters news agency. He added that several civilians had been killed. There has been an increase in violence in Mogadishu in recent weeks, including night-time mortar raids and daytime clashes between the security forces and al-Shabab. Last week, the group carried out a car bomb attack outside the presidential palace in Mogadishu, killing officials and guards. Al-Shabab was driven out of Mogadishu in 2011 but it still controls many smaller towns and rural areas of the country.